Purple Majesty Chinese Fringe Tree has a deep burgundy new growth which darkens into a deep purple color with maturity. 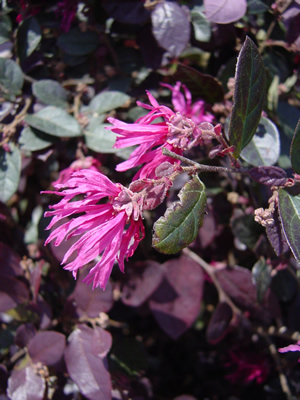 This beautiful foliage is topped from spring to fall with hot pink pom-pom like flowers. Loropetalum chinensis var. rubrum ‘Purple Majesty’ can reach 6-8′ tall and is very similar in looks to ‘Plum Delight’ ™. This shrub prefers a well drained non alkaline soil and will show chlorosis in a high pH soil. Purple Majesty is hardy to 15-20° F.